Hinshaw, Joseph, age 27, born in Indiana; farmer/renter; $551 personal property. Hinshaw, Sarah J, age 29, born in Indiana; keeping house. Hinshaw, Mary, age 4, born in Missouri. Hinshaw, Annie, age 2, born in Iowa. Gibbs, David, age 16, born in North Carolina; hired man. Hockett, Berllie [unclear], female, age 9, born in Iowa. Henshaw, J.R., age 37, born in Indiana; father born in Tennessee; farming. Henshaw, Sarah Jane, wife, age 37, born in Indiana; keeping house. Henshaw, Mary, daughter, age 13, born in Missouri; parents born in Indiana; attended school. Henshaw, Anna, daughter, age 11, born in Iowa; parents born in Indiana; attended school. Henshaw, Loucindia, daughter, age 10, born in Iowa; parents born in Indiana; attended school. Henshaw, Thomas, son, age 7, born in Iowa; parents born in Indiana. Henshaw, Lourilla, daughter, age 5, born in Kansas; parents born in Indiana. Henshaw, Guy, son, age 2, born in Kansas; parents born in Indiana. Hinshaw, Joseph R., head-of-household, age 57, born Apr 1843 in Indiana; father born in Tennessee; mother born in Indiana; married 35 years; occupation: day laborer; rented home. 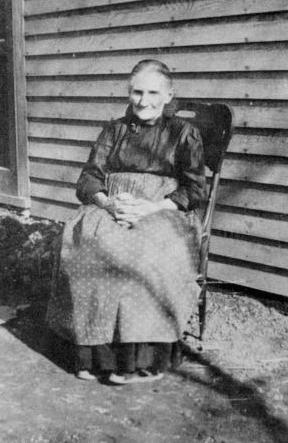 Hinshaw, Sarah J., wife, age 58, born May 1842 in Indiana; father born in Ireland; mother born in North Carolina; married 35 years; 17 children, 9 living. Hinshaw, Thomas E., son, age 27, born Nov 1872 in Iowa; parents born in Indiana; single; occupation: day laborer. Hinshaw, Guy W., son, age 22, born Apr 1878 in Kansas; parents born in Indiana; single; occupation: day laborer. Hinshaw, Giff F. [initial unclear], son, age 19, born Oct 1880 in Kansas; parents born in Indiana; single; occupation: day laborer. Bass, Leonard W., head-of-household, age 29, born Feb 1870 in Indiana; parents born in Indiana; married 7 years; occupation: day laborer; rented home. Bass, Lucinda S., wife, age 29, born July 1870 in Iowa; parents born in Indiana; married 7 years; 3 children, 1 living. Bass, Ernest D., son, age 2, born Mar 1898 in Missouri; parents born in Indiana [sic]. Fields, Nelson, head-of-household, age 28, born Oct 1871 in Kansas; father born in New York; mother born in Illinois; married 3 years; occupation: day laborer; rented home. Fields, Lorrie L., wife, age 24, born June 1875 in Kansas; parents born in Indiana; married 3 years; 1 child, 1 living. Dakin [unclear], Marie [unclear], head-of-household, age 34, born Mar 1866 in Missouri; parents born in Indiana; widow; 3 children, 1 living; rented home. Gasswint, Sadie, daughter, age 12, born May 1888 in Kansas; father born in Pennsylvania; mother born in Missouri; attended school 9 months. Hinshaw, Joseph R., head-of-household, age 67, born in Indiana; father born in Tennessee; mother born in Indiana; first marriage, married 44 years; occupation: laborer, odd jobs; rented home. Hinshaw, Sarah J., wife, age 72, born in Indiana; father born in Ireland; mother born in Indiana; second marriage, married 44 years; 18 children, 6 living. Gaswint, Sadie, granddaughter, age 21, born in Kansas; father born in Pennsylvania; mother born in Missouri; single; occupation: servant, hotel. Hinshaw, Thomas, son, age 37, born in Iowa; parents born in Indiana; single; occupation: laborer, on street. Joseph Rhoads Hinshaw died Jun 7 19184 [Apr 7 19217], Clay Center, Clay County, Kansas4. Contribution from Dee March (). 1880 census, Chapman Township, Ottawa County, Kansas; roll T9-0392, ED 219, page 375A, line #2, dwelling #116, family #122. 1870 census, El Dora P.O., Providence Township, Hardin County, Iowa; roll M593-394, page 479, line #22, dwelling #13, family #13. 1900 census, Clay Center, Clay County, Kansas; roll T623-474, ED 5, page 2B. line #67, dwelling #50, family #51-54. 1910 census, 3rd Ward, Clay Center, Clay County, Kansas; roll T624-434, ED 5, page 111A. line #2, dwelling #177, family #184.